Giuseppe Cardegna first appears at Painesville, Lake County, Ohio, in 1899. Giuseppe Cardegna, his wife, Lucia Maria Amoruso, and their children, moved to Painesville, Ohio, from Buffalo, New York, in 1899. In America, Giuseppe Cardegna was known Joseph Cardina. Giuseppe Cardegna, son of Felice Cardegna and Maria Giovanna Fazioli, was born on June 16, 1860, at Frosolone, Isernia Province, Molise, Italy. Giuseppe married Lucia Maria Amoruso, daughter of Rocco Amoruso and Giovanna Padula, on July 23, 1889, at Santa Maria Assunta Chiesa, Frosolone, Isernia Province, Molise, Italy. Lucia Maria Amoruso was also born at Frosolone, Italy. 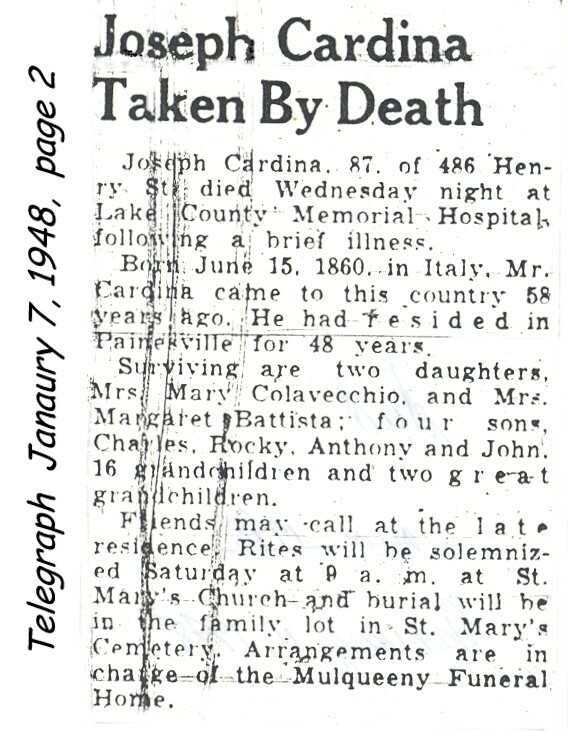 Giuseppe died on Tuesday, January 6, 1948, at Lake County Memorial Hospital, Painesville, Lake County, Ohio, at age 87, of pneumonia. His body was interred at St. Mary Cemetery, Painesville Township, Lake County, Ohio. Giuseppe Cardegna immigrated to the United States on February 19, 1890, at age 29. He immigrated with his wife, Lucia Maria Amoruso. They entered the United States at the Port of New York City aboard the ship SS Entilla. Joe and Lucy Cardina initially settled in Jersey City, New Jersey in 1890. They moved to Waterbury, Connecticut, in 1892. The family moved to Buffalo, New York in 1894. They finally settled in Painesville in 1899. Giuseppe Cardegna was enumerated for the 1900 Census of the United States, on June 26, 1900, living at 208 Elm Street, Painesville Village, Lake County, Ohio, as a head of household. Giuseppe Cardegna was enumerated as Joseph Carty. Giuseppe Cardegna was enumerated for the 1910 Census of the United States, on April 23, 1910, living at Henry Street, Painesville, Lake County, Ohio, as a head of household. Giuseppe Cardegna was enumerated as Joe Cardine. Giuseppe Cardegna was enumerated for the 1920 Census of the United States, on January 13, 1920, living at 114 Henry Street, Painesville City, Lake County, Ohio, as a head of household. Giuseppe Cardegna was enumerated as Joe Cardina. Giuseppe Cardegna was enumerated for the 1930 Census of the United States, on April 15, 1930, living at 486 Henry Street, Painesville City, Lake County, Ohio, as a head of household. Giuseppe Cardegna was enumerated as Joseph Cardina. 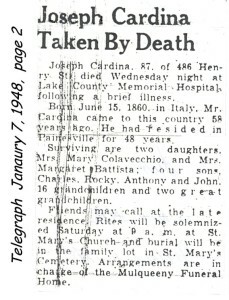 Giuseppe Cardegna was enumerated for the 1940 Census of the United States, on April 9, 1940, living at 486 Henry Street, Painesville, Lake County, Ohio, as the father of John J. Cardina. Giuseppe Cardegna was enumerated as Joseph Cardina. At the time of his death, Giuseppe resided at 486 Henry Street, Painesville, Lake County, Ohio. Giuseppe Cardegna’s brothers, Domenico Cardegna and Michele Arcangelo Cardegna also lived in Painesville, Ohio. 1. Felix John Cardina was born on August 29, 1891, at Jersey City, Hudson County, New Jersey. He died on September 26, 1919, at Willoughby, Ohio, at age 28, in a train-car accident. His body was interred at St. Mary Cemetery at Painesville Township, Lake County, Ohio. 2. Charles Joseph Cardina was born on September 1, 1892, at Waterbury, New Haven County, Connecticut. Charles married Mabel M. Ferguson in 1927. He died on April 23, 1960, at Painesville, Lake County, Ohio, at age 67. His body was interred at Riverside Cemetery at Painesville, Lake County, Ohio. 3. Mary Cardina was born on December 12, 1894, at Buffalo, Erie County, New York. 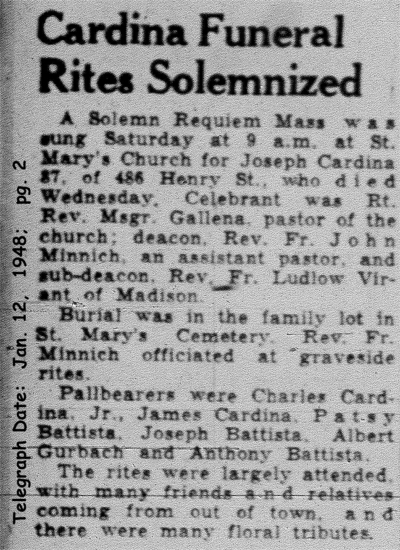 Mary married Antonio Nucciarone, son of Giacomo Nucciarone and Maria Carmina Incoronata Colarusso, on February 1, 1910, at St. Mary Catholic Church, at Painesville, Lake County, Ohio. Mary Cardina was widowed by the death of Antonio Nucciarone on Jul 17, 1916, in Buffalo, Erie County, New York. 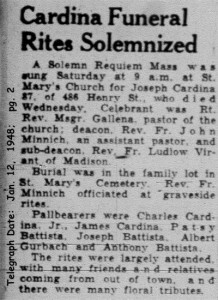 Mary married Giuseppe Colavecchio, son of Felice Colavecchio and Saveria Mattarocci, on November 11, 1917, at St. Mary Catholic Church, at Painesville, Lake County, Ohio. She died on May 6, 1971, at Lake County Memorial Hospital, at Painesville, Ohio, at age 76. Her body was interred at St. Mary Cemetery at Painesville Township, Lake County, Ohio. 4. Rocco N. Cardina was born on November 6, 1896, at Buffalo, Erie County, New York. Rocco married Antionette Stinziano, daughter of Giuseppe Stinziano and Maria Annunziata Paduano, on August 19, 1920, at Cleveland, Cuyahoga Country, Ohio. She died on November 28, 1979, at Painesville, Lake County, Ohio, at age 83. His body was interred at St. Mary Cemetery at Painesville Township, Lake County, Ohio. 5. Anthony Michael Cardina was born on June 13, 1900, at Painesville, Lake County, Ohio. Anthony married Incaronata “Anna” Stinziano, daughter of Giuseppe Stinziano and Maria Annunziata Paduano, on November 14, 1925, at Cleveland, Ohio. He died on March 23, 1970, at Painesville, Ohio, at age 69. His body was interred at Riverside Cemetery at Painesville, Lake County, Ohio. 6. Margaret Mary Cardina was born on March 28, 1902, at Painesville, Lake County, Ohio. Margaret married Nunzio Battista, son of Pasquale Battista and Maria Angela Fortunata, on April 7, 1921, at St. Mary Catholic Church, at Painesville. She died on July 27, 1985, at Painesville, Ohio, at age 83. Her body was interred at Riverside Cemetery at Painesville, Lake County, Ohio. 7. 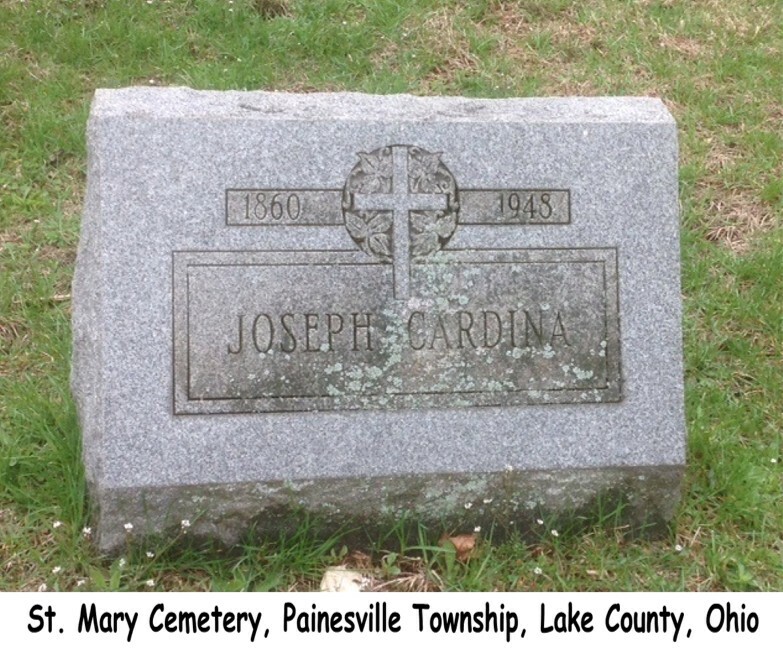 John J. Cardina was born on February 28, 1907, at Painesville, Lake County, Ohio. John married Sue Bell, daughter of Lewis T. Bell. He died on June 14, 1971, at Painesville, Ohio, at age 64. His body was interred at Riverside Cemetery at Painesville, Lake County, Ohio.